The popularity of eSports games has skyrocketed ever since their debut into MOBAs. MOBA stands for Multiplayer Online Battle Arena, which is a genre of strategy videogames in which a player controls a single character in one of two teams. Your goal is to destroy your enemy team’s ‘inhibitor’ (this is for LoL players), which is the main structure inside the enemy’s base camp, with the help of spawned computer-controlled units. The characters (either called heroes or champions) have various abilities and different advantages that improve the course of the game and contribute to the team’s winning strategy. MOBA is a real-time strategy game, which means the players can interact at real-time using the game’s chat system. As of now, some of the most popular computer MOBAs include Defense of the Ancients 2 (DOTA2), League of Legends (LoL), Smite and Heroes of Newerth. But smartphones aren’t behind in the MOBA scene. Different companies have created A LOT of MOBA games of Android smartphones. Today, we’ve listed the top 5 MOBA for Android phones this year! With over 5 million downloads, Heroes Arena certainly lands on this list. Created by uCool, this games boasts a lag-free global 5v5 mobile game. The game has an interesting system that goes a lot like League of Legends. The game has a 5-skill system for your hero: 1 passive skills and 4 active skills. There you can also set up the stats you want to take in your matches. Inside the game, you can earn diamonds in the game aside from using cash. You can get them from time to time by quests, achievements or chests. In this way, you can actually have a hero skin you like without spending money. Because of its new status, this serves as a disadvantage for HA. New MOBA games in mobile have few players the higher your rank is, making it longer to wait in match making. In Heroes Arena, when you reach diamond division, it can take you a long time before you can play because only a few have reached this tier. Heroes Evolved is called as one of the best Mobile Legends alternative in the mobile MOBA world. HE is mostly a free-to-play 3D fantasy MOBA that has the combined elements of League of Legends and DOTA 2. The map is similar to ML with its three lanes and a river dividing the territories. HE has over 55 characters available that have roles inspired by LoL and Dota like Carry, Ganker, Disabler, and Nuker. The game also offers multiple modes like custom matches, randomized hero picks, solo queue, ranked and more. Another great feature of this game is that every match is recorded, allowing players to save and analyze their gameplay after each match. With over 5 million downloads and a lightweight 35MB download which allows players to enter the game almost instantaneously, this certainly puts HE on top of a lot of mobile MOBAs. Unfortunately, the game got a lot of negative rating for being the first pay-to-win MOBA. Currently, ML has over 50 million downloads from half a year release, making this game on of the most popular mobile MOBAs this year. If there’s a simplified mobile version of League of Legends, this would probably be it. I have played LoL for a few years now and this is more of a LoL-copy than any other games on the list. Many of their heroes are eerily similar to LoL. But recent updates have been made that change their appearances and skills. The game has pre-made stats for different roles and also three different item builds that you can customize beforehand. The game has a 4 skill set: 1 passive skill and 3 active skills. There is also 2 extra skills that are available in the matched and ranked games. There are also different modes including brawl mode and custom mode. Collecting gold is easier in this game since creeps will drop coins even if you’re not the one who gave the last hit. And, they have a lot of freebies and prizes you can gain from this game. Moonton has made their heroes well-balanced, which is really hard for a lot of MOBAs to do. But because of constant new updates involving new heroes and skins, connection issues are very common of ML. This is a serious factor why there are several players from ML who transfer to Vainglory because of disappointing lag issues. 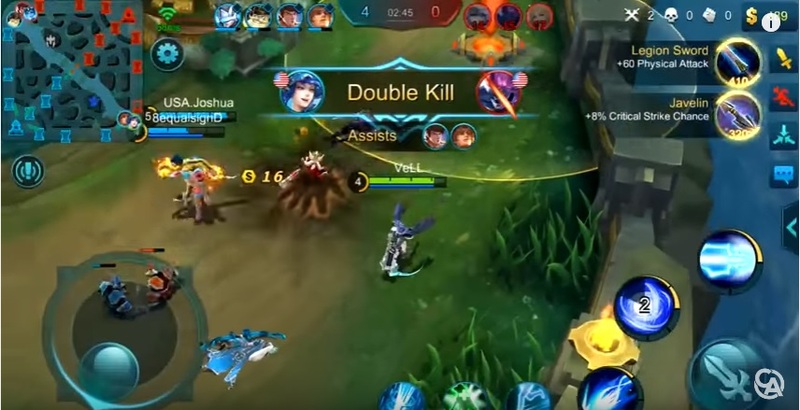 Don’t worry though, Moonton is currently making ways to make the lag issues more manageable. This MOBA game is a spin-off title to Gameloft’s World of Warcraft wannabee Order & Chaos. Though it does have a different gameplay. While Order & Chaos is all about questing and forming alliances, Heroes of Order & Chaos has a more tactical experience. The MOBA features 2 maps which you can explore every nook, crannies and alternative routes. Your team is either made up of live players or AI-controlled heroes. But you aren’t just battling against enemies in this game- the landscape is also a challenge since both maps are massive and packed with variety. You can pick one of the six character classes when you begin your game. Other choices are locked behind a paywall. You can customize your warrior to suit your own taste by making use of the game’s skill tree. Super Evil Megacorp has certainly done a good job of having created this MOBA. Vainglory is a 3v3 MOBA which has been ‘perfected for touch’ as they put it. Their map only has a single lane with a jungle below it. Like most MOBAs, victory is decided by destroying the opponent’s Vain Crystal. Unlike most MOBAs, your heroes only have one ultimate ability and 2 normal spells, though you still have last hitting and on use items. Heroes are split into 3 roles: Lane, Jungle and Roam. This game also has different game modes. What’s nice about their shop is that you can buy things with either real money or in-game currency. It also comes with customization control schemes across the board to tweak to your liking and have scaling options for varying screen sizes. From a technical standpoint to a gameplay standpoint, VG is at the top of the list. It plays smoothly and anyplace with an internet connection. It is also easy to stay in contact with your friends in the guild and party system. Their connection issues are also not a problem. Wish you have the best app for your mobile app. Thanks for your enthusiasm!